Why Step into Life Woonona? At Step into Life Woonona.....our Unique difference is....We do it Outdoors! Run by the experienced and friendly Tiv Nightingale, at Step into Life Woonona we provide a fun and welcoming environment and if you live anywhere near our beautiful suburb of Woonona, you are in luck! Our philosophy is that people create and mould the success of others, not machines or equipment. Hi...I'm Tiv Nightingale the head trainer at Step into Life Woonona. I’ve been into fitness for over 25 years, my training experience is wide and varied. I come from a personal training, boxing and martial arts back ground and I’m a firm believer in coaching, inspiring and motivating people to reach their fitness and health goals. I’ve been there and done that, and I know what it takes to get you to your personal fitness and health goals. We can discuss these goals and how we will work together to achieve them. Training for a fun run? achievit outdoors with Woonona fitness training. 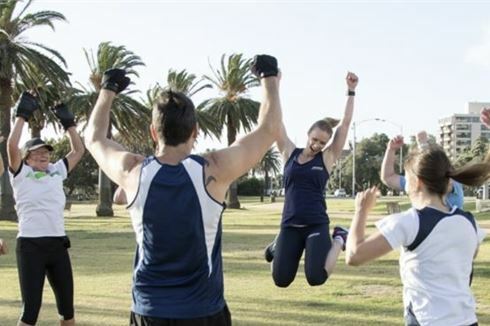 Wynnum Woonona classes outdoors will have you burning calories in no time. Cardiomax is the ultimate Woonona outdoor fitness training program. Coreball focuses on improving your core strength. Woonona corporate fitness programs? Step into Life has your business covered. Woonona bootcamp style drills headline our endurit program. Dynamic strengthening using Woonona Yoga and Pilates style principles. Improve muscular strength with Toneup at Step into Life Woonona. The unique difference of Step into Life Woonona is that we do it outdoors! Why box indoors when you can enjoy Woonona boxing outdoors in the fresh air. At Step into Life Woonona we’ve done away with the admin tax, instead we’ve created a starter pack filled with community benefits, nutrition guides, progress trackers (just to name a few!) to set you on the path to a healthier lifestyle.